With new music and visuals dropping over the last month having people talking left right and centre (most importantly enjoying the music) Midas Touch are on the end of most peoples lips when it comes to UK HipHop. With a performance at R7 coming up we caught up with the trio AKS, Pheonix Da Fire and J The Exodus to find out just what they are all about! How did you guys first meet and come together? J: We all go way back! I have personally known AKS since the age of 5 and P since my teens. J: When we left school, I eventually moved away from the area and we lost contact but then myself and P attended the same secondary school and began to do some work together after we left. P: Ironically me and AKS lived on the same block and were involved musically so I guess it was destiny we all came together as a collective and knew the synergy would work. P: We were contemplating various names and I suggested Midas Touch, we all loved it straight away as we felt it was reflective of when we blessed a track or performed, the gold touch, that Midas Touch. A: I distinctly remember visiting P’s house and his youngest brother was watching Disney’s Aladdin and the King of Thieves in the background. Don’t say those old Disney movies didn’t inspire a generation. My first Midas Touch experience was at Cargo for J’s launch. Personally I felt a lot of good energy and even more love. What do you guys experience when you’re on stage and how does it differ when you are solo? J: When we do the collective thing and pragmatically work together it feels natural, we have known each other so long so it almost becomes second nature when we perform, write or cypher. We all consider ourselves as soloists so just doing music on a whole is a passion, when we collab and perform together it feels like sharing a passion with your own brothers. A: Before we did music together we we’re friends, so it’s only natural that the comradery we share transcends to the stage and the music. It’s a beautiful thing to be able to share the stage with guys I’ve shared dreams with since conception. 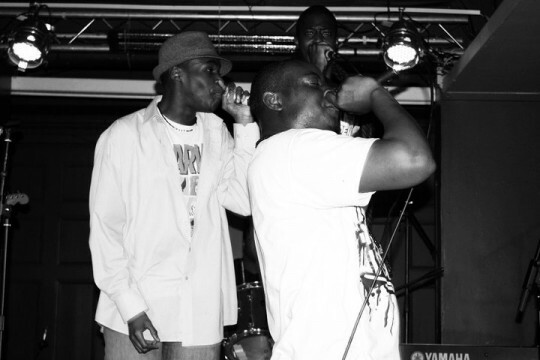 Every time we step out on stage its like we’re realising those dreams afresh. A: I’m gonna say the booth. I’m in love with writing and I’ve nurtured that talent for a longer period of time. I love the stage too, don’t get me wrong, the pull of that is the effect a performance can have on even the hardest of hearts; but I think it’s something we’ve all had to work pretty hard at being confident in. J: Hard one! I love recording material and creating material, in the booth you can go back and correct/perfect things accordingly, the great thing about performing is it’s all about the occasion the energy the buzz! Both equally important and enjoyable. You are all successful in your own right, why come together? J: It’s like any great artist it’s fundamental to have a collective, I can’t think of one artist who is not associated with or part of a movement either in collaborated sense or as part of a group. Groups like Black Hippy, Fugees, A Tribe Called Quest, The Firm, The Lox, Wu Tang etc I like to think we are reminiscent of, all great groups but also great soloists. Again we share a passion and outside of the music we got love and respect for each other too. Very important for people of are age and social demographic to show unity also. J & A: PHOENIX! (In Unison)! Do you improve each other? P: Getting on a track with these guys…”The stakes is high” lol. To be the best you have to train with the best. I think we’ve always inspired each other to improve track to track. A: To coin a phrase “Iron sharpens iron!” It’s inevitable that we’d have a bit of friendly competition within the camp. Rap is like sport, and although we’re running the relay when we’re a group, each of us still wants the fastest leg. J: That being said, we all respect each other ability and you know we all have to up the game when we collaborate. We’ve had the first 2 videos and downloads what’s next? P: Now that would be telling wouldn’t it. If you know anything about us, you should know we like surprises. Talking is one thing, doing is quite another…and we’d rather just DO! J: Be yourself, do what ever comes naturally but be responsible in that. We use music as our expression which we believe is the way music came into existence. What can we expect from your R7 set? P: Electricity! High octane energy! We just want to go out there and enjoy the experience. Skill and hip hop in its authentic form. Greatest rapper of all time? J: In my opinion it’s gotta be Nas, not only for his lyricism but his longevity, he has had to adjust through various eras in hip hop so still to be considered the best is a major feat! There are other legends that I feel Nas learned from – Rakim, Big Dady Kane, Kool G Rap and Slick Rick in particular. Salute to them!